"Aloha from Hawaii! 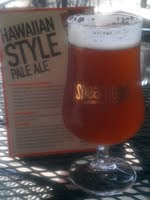 As the name suggests, this bold, hoppy West Coast pale ale is brewed Hawaiian style—with pineapple. We stopped at nothing to create this perfectly "imbalanced" and supremely delicious pale ale. Hawaiian Style Pale Ale is naturally carbonated, unfiltered and dry-hopped to provide a delicate carbonation and complex flavour and bouquet. Hints of caramel, honey and biscuit give way to notes of fresh citrus, zest and pine and a refreshingly tropical finish." On tap at the London launch at Gambrinus. Served with a nice finger of white head in a tulip styled glass. As it fades it leaves some decent lacing on the glass. Unfiltered and hazy with a beautiful orange coloured glow. Huge Centennial and Cascade hop notes. Lovely citrus, tropical fruits and pine along with undertones of earthiness. Some sweetness to the malt smell, slight spice. You can smell the pineapple, but without it being dominant in the nose. This beer has a very nice aroma that any hop head would enjoy. I've said it before, I love Centennial and Cascade hops. This beer is big with those favours that you would expect from a them . Nice pine earthiness, tropical fruits are well balanced. Sweet to the finish and the after taste pushes the pineapple through just slightly more than could be expected from the hops alone. There is also some pleasant bitterness present. For their first release, I think Spearhead has made an excellent first offering. They have taken a high hopped IPA and enhanced the tropical fruit notes by adding pineapple juice. While this does add to the sweetness, they have done it in a way that creates an interesting depth to the beer with out being different for the sake of it alone. This is a very solid beer. I would give it an A. If you get a chance definitely check this out.